Yoo Hoo! School is almost over. Children and teachers might shout something like this near the end of every term, though as a rule retirees don’t. But I’m saying it now. I’m sick of homework and happy to have almost finished. I’ve gotten what I want out of “Genealogy and Historical Research” and done my own hysterical research as I count up the hours I’ve spent completing assignments. I reported in an earlier blog that my maternal grandmother completed only a fourth-grade education. I couldn’t find much information on my paternal grandmother, except that her father was born in Germany and her mother in Sweden. My mother’s great-grandparents on her father’s side were from Derry County, Northern Ireland, and one great-great-grandfather came from Devonshire, England. My mother’s home town no longer exists, and by 2013, the population of my father’s had shrunk to 125. All the information you find on different genealogy sites — from birth certificates to census records to tombstone dates — is only as accurate as the person who records the information. Researchers should expect to encounter mistakes. I religiously use my full legal name for everything official, though my parents never used it and most of my friends and acquaintances don’t even know it. My ancestors weren’t nearly as fastidious. My maternal grandmother appears in different documents as Katherine, Kathryn, Kate and Katie. Her cousin appears as Lucinda Mary, and also as Lucinda May, but more often than not as Lula. Lula had a sister named Orah, who comes up in census data as Cora. Genealogy is like detective work, requiring patience, full attention to detail, and persistence. After this quarter, it’s clear I’d never make a good detective. I’m happy knowing different ancestors’ approximate vital statistics. The blanks in my six-generation ancestral chart will probably remain unfilled unless someone else figures out how to complete them. There is one topic I wish I knew more about. My mother once told me she had been married at a young age to a man who was not my father. I have the marriage license and she was right about being young: sixteen. 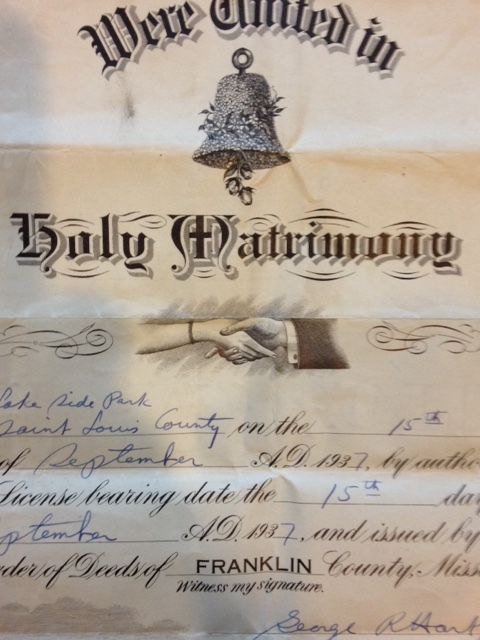 I have another document, which is a petition for divorce dated “May 1939.” According to this, “The plaintiff married the defendant [my mother] on September 15, 1937, and continued to live with her until on or about the 13th day of December, 1937. The plaintiff states that defendant has absented herself without a reasonable cause for the space of One (1) year.” I believe there was reasonable cause and it was my grandmother, who, according to my mom, had the marriage annulled. The petition for divorce tells a different story, but doesn’t change the fact that my grandmother wanted the marriage ended. I’ve found my mom’s first husband on ancestry.com, but the available information is minimal. He seems not to have married again. Maybe he didn’t want to risk being quickly dumped a second time. I did learn that he is buried in a veteran’s gravesite in Missouri, the state where he and my mother met. So my mother was officially married for about twenty months. And when she married my dad seven years later, her married name appeared on the license. I’ve written for a copy of the divorce decree. Just wanted to make sure she really did divorce before she married my dad. This entry was posted in friends and family, intergenerational and tagged ancestors, exploring your past, family history, genealogy. Bookmark the permalink. Pretty darned interesting. Now how much fits into your next novel? The next novel will be a historical fiction based on ancestors, but not my immediate family. Delighted to see that there is a Swedish ancestor ! I was happy about the countries of origin, but I’d also hoped for Dutch and/or French. A friend just did the 23 and me DNA tests. I was considering it, but $199 seems like a lot, especially if it doesn’t tell me any more than my ancestry.com research did. Enjoyed your dalliance with detective work. Reminded me of some detective novels and programs I’ve enjoyed reading and watching. Did you find Murdock’s Mysteries? Just reserved two seasons from the library. I guess one of the amusing parts of doing research on ancesters is that you can’t change a thing about them if you disapprove of what you learn. Ah well :-). . I didn’t ever feel like I wanted to change anyone. Though I did wish I’d asked more questions earlier. I have a question or two as well, but I’ll share that tidbit with you over brunch some day. Just remind me 🙂 I think your discoveries are fascinating. Our parents’ generation did not like to talk about their mistakes (some of them would have said “sins”). I wonder if the next generation, who tell everything to everyone, will be better known by their children? I was surprised about the number of divorces in one branch of the family. I thought divorce was a more recent phenomenon.